Free and open source roguelike/RPG Tales Of Maj'Eyal (ToME) version 1.0 has been finally released after being in development for more than 3 years. DarkGod (lead developer of the project) has released 4 release candidates in just two weeks time to release version 1.0 as a new year gift to roguelike lovers. 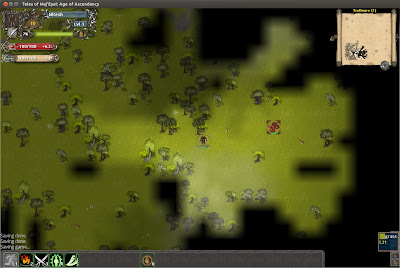 ToME features tactical turn-based combat and advanced character building. You can play as one of many unique races and classes in the lore-filled world of Eyal, exploring random dungeons, facing challenging battles, and developing characters with your own tailored mix of abilities and powers. The game has over 10,000 players and you can find hundreds of players in the game at any point of time. ToME supports online gameplay so you can chat with fellow players in game and share your character stats. An online profile also ensures that all your saves, achievements and unlocked goodies are stored on ToME's server, allowing you to play the game on any computer without worrying about copying saves and other files from one system to another. Online gameplay is optional, you can play the full game offline as well. Another cool feature of ToME is community made addons that can be used to customize the game any way you want. For instance, OldRPG Tileset and UI addon makes the game look like a classic 16 bit RPG while Infinite500 addon allows you to play the game beyond level 50 cap. Though ToME is free, you can donate to get some extra features like an additional playable class and an online items vault. You can complete the game without these extra features, but donating to developers helps them in improving the game. The donators only extra class will be released for free in future. Download Tales Of Maj'Eyal 1.0.0 Aka "And The Sky Full Of Stars"